Nicotye Samayualie was born on November 25, 1983. She is the daughter of Kudluajuk Ashoona and Johnny Tunnillie Samayualie. 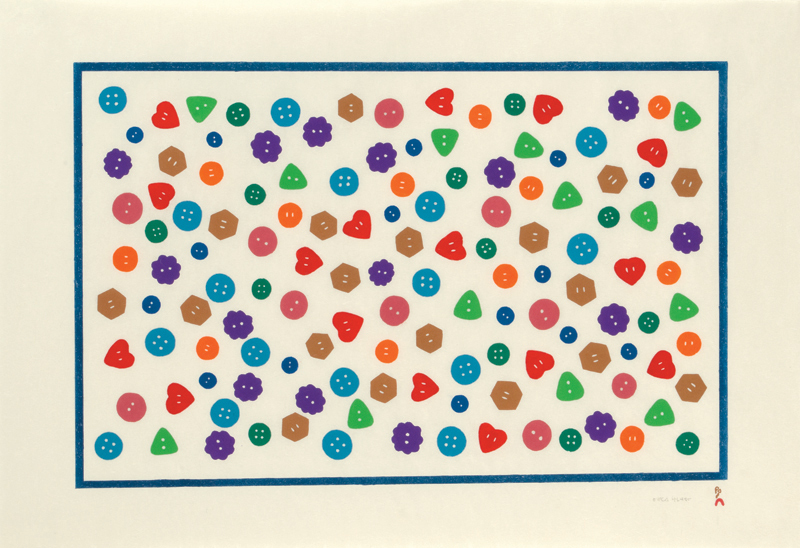 Nicotye’s grandmother, Keeleemeeoomee Samayualie was a well known graphic artist whose prints were represented in the Cape Dorset annual print collections throughout the 1970’s and 80’s. Nicotye is fascinated by patterns and arrangements of disparate objects in nature and man-made materials. Many of her drawings depict everyday items such as the contents of a pantry shelf, a table of shiny fishing lures or boxes of camping supplies. Nicotye has had her original drawings shown at the Toronto Art Fair and in 2013 her work was featured in an Italian publication, ‘Annie e le Altre’, an ambitious scholastic study that explored the role of women artists in Cape Dorset.